Baked shrimp scampi is a perfect seafood meal when you don’t have a lot of time to cook. This baked shrimp recipe without wine is fast, easy, and delicious! If you are looking for a shrimp recipe for busy nights when you don’t have time to stand by the stove, you’ll love this one! In around 20 minutes you’ll have a delicious dinner, full of flavor, ready to eat! The thing is, although I love to cook, having three young children doesn’t make it easy to whip up a complicated shrimp scampi sauce, especially during the week. 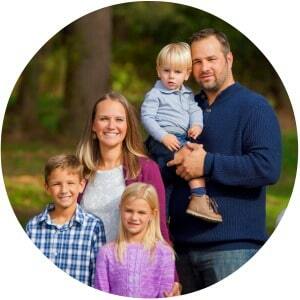 So I am always on the lookout for ways to make those complex recipes more mom-friendly. 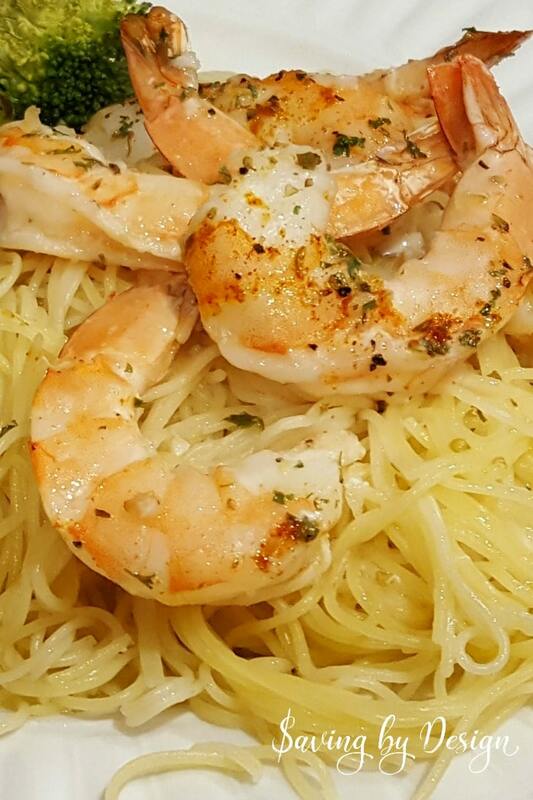 I love shrimp and anything scampi has always been one of my favorites…I can never get enough garlic! But when I think of scampi I envision standing by the stove, mixing in a few ingredients at a time, and keeping a careful watch so nothing cooks too quickly or burns. Enter my family and that can be a disaster! 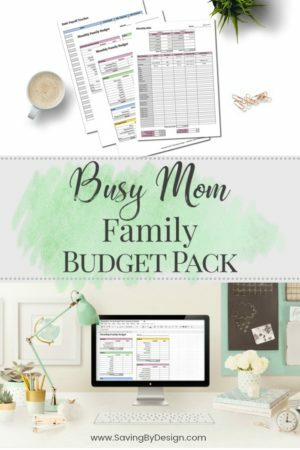 So I need easy – easy and delicious! 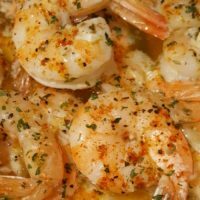 I have to admit that I never thought of making shrimp in the oven until I came across this easy recipe for shrimp scampi…although now we have another favorite baked shrimp recipe too that’s just as yummy! So how exactly do you bake shrimp? How you prepare your shrimp depends on the recipe…some may need to be peeled, and others you can leave the shell on. I almost always end up leaving the tails since they add so much flavor as they cook. No matter how you prepare your shrimp, they are baked pretty much the same way. Preheat oven to 350 degrees. Arrange the shrimp in a single layer in a baking dish, casserole dish, or baking sheet. Then season the shrimp or add whatever sauce they will be cooking in. Finally, bake until they turn pink – usually about 10 – 15 minutes depending on the size of the shrimp and if they were thawed or frozen. 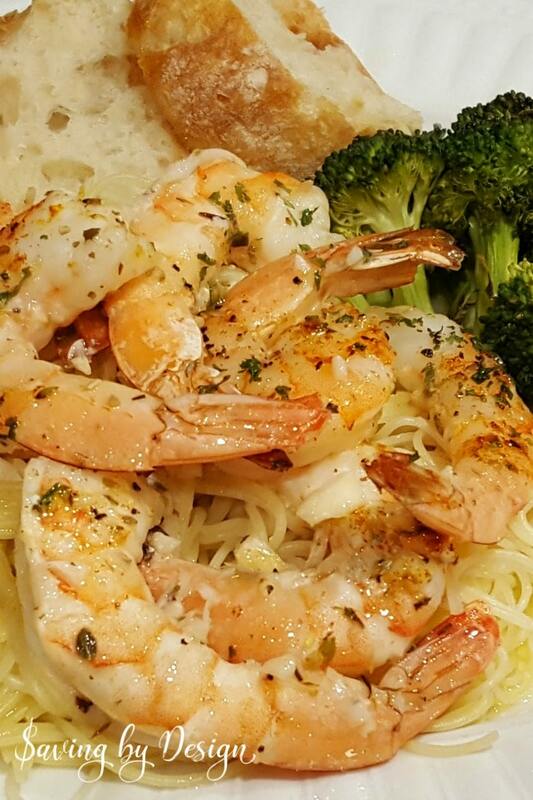 As you can see in the photos, we like to serve over pasta, with broccoli on the side, and crusty bread to soak up the shrimp scampi sauce. Putting the whole meal together is easy – at the same time I bake the shrimp, I roast the broccoli in the oven (just drizzle with olive oil and season with salt, pepper, and chopped garlic) and boil the angel hair. To get started preheat oven to 350 degrees. If you are using frozen shrimp, thaw and peel leaving tails on. Add the shrimp in a single layer to a 13 x 9 baking dish or casserole dish. 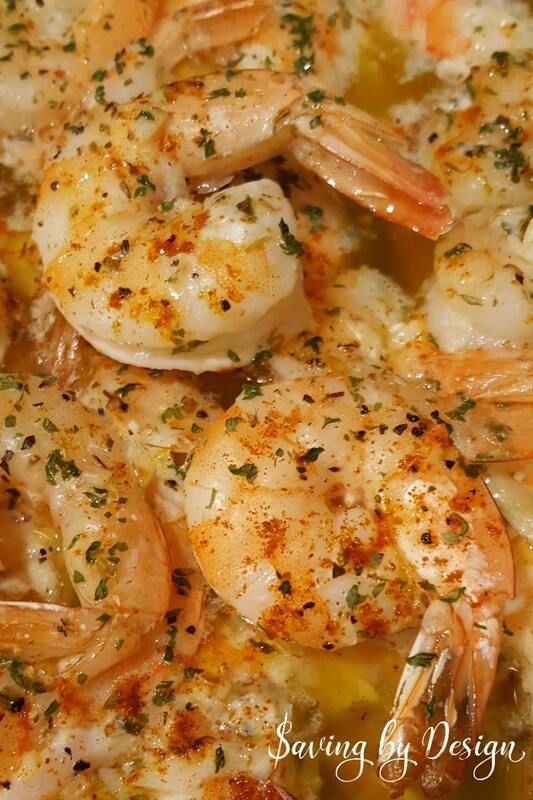 Prepare the scampi sauce by mixing lemon juice, garlic, salt, pepper, and oregano until salt crystals have dissolved. Whisk in the olive oil. Pour the sauce over your shrimp and place butter slices on top. I like to lightly season on top with additional salt, pepper, and oregano. You can also season with dried parsley and paprika for color if desired. Bake for 10 minutes or until shrimp are cooked – the exterior should turn pink with red tails and the flesh will be slightly opaque and a little “white” in color. Baked shrimp scampi is a perfect seafood meal when you don't have a lot of time to cook. This shrimp recipe without wine is fast, easy, and delicious! If using frozen shrimp, thaw and peel leaving tails on. Add shrimp in a single layer to 13 x 9 baking dish. Prepare sauce by mixing lemon juice, garlic, salt, pepper, and oregano until salt crystals have dissolved. Whisk in olive oil. Pour sauce over shrimp in baking dish. Place butter slices on top of shrimp. Lightly season on top with additional salt, pepper, and oregano. You can also season with dried parsley and paprika for color if desired. Bake for 10 minutes or until shrimp are cooked - the exterior should turn pink with red tails and the flesh will be slightly opaque and a little “white” in color. This recipe will make enough sauce for up to 2 lbs of shrimp. Have you found an easy shrimp scampi recipe? I’d love to hear what you think of this one! Made this just tonight with a nice Ribeye, oh so very good and simple. Thank you so much! I have frozen cooked shrimp. Would I cook it less time in the oven? Maybe thaw them and let them marinate in the sauce for a little while? Then just put them in the oven long enough to make sure they are heated through? I have been looking for a shrimp scampi recipe forever! Thank you so much. This sounds delicious and I cannot wait to make it. Yum!!! Great recipe and very easy with ingredients I had on hand. I paired it with Uncle Ben’s Jasmine Ready Rice which cooks in a little bag in the microwave in 90 seconds and is delicious. I really appreciate a time saving recipe with first class flavor such as this. Thank you! Hi Licia! Thanks for stopping by! Made this last night and it was a no go with my 13 year old. The oregano was a bit too much. She ended up eating a can of Ravoli. I had a bowl and it was okay. Lots of olive oil for my liking.